If you are looking for web tutorial on how to implement Dropzone.js library in your existing PHP web application, then this post will help a lot. Using this tutorial you can easily implement Dropzone.js library with you PHP application. If in you PHP application you have file upload feature then by using this library you can give stylish looks to your file upload feature. 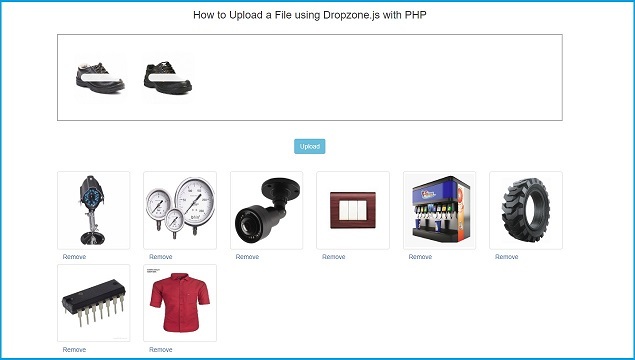 Dropzone.js library will also help you to make drag and drop file upload feature very easily with your PHP script. So, by using this tutorial you can learn how to use Dropzone.js library for file upload with single or multiple drag and drop file on server using PHP script. tag we need to write attribute like action, class and id. Here action attribute has defines the actions to upload file to server side and .dropzone class identifier of the Dropzone library. with id #dropzoneForm attribute. Here we have set options of this library like image validation using acceptedFiles:".png,.jpg,.gif,.bmp,.jpeg", option. Here we have disabled immediate upload image to server by using this autoProcessQueue: false, option. Under init() function we have define button click event, so when we have click on button then image will be upload to server. After upload of image we want to clear Drag and drop area, so we have define code under "complete" stage of DropzoneJS library. Whole code you can fine below. For display uploaded image on webpage after uploading complete, for this we have make on function, this function will fetch all images from upload folder and display on web page. Same way we want to remove any image from server side, for this also we have define one remove button with each image. We have to click on that remove button and image will be deleted from folder and after this it will display remaining images on web page. Below code is used for server side upload image, fetch image from folder and remove image from server. So, this step by step process for how to use Dropzone.js with PHP, if you have any query about this post tutorial or script you can feel free to comment below in comment box. Below you can find complete source code. how will i block multiple pic upload?? ?